To enable use of drives of different sizes, the Drobo virtualisation layer (see BeyondRAID section) sits on top of the physical drives. Because Drobos are data aware, data is placed intelligently in the best place on the drives. With the introduction of SSD support in the Drobo B1200i, Drobo 5N, Drobo 5D, and Drobo Mini, SSDs provide a faster tier of storage for data that is transactional in nature, the type of data that benefits from the faster write and access speeds SSDs provide. Data-Aware Tiering on the Drobo B1200i is the first and only totally automated way for small and medium businesses to affordably utilise SSDs to accelerate their application performance. It involves zero configuration and shows immediate results. An ESG Lab Validation Report documents hands-on evaluation and testing of the Drobo B1200i. Tiering is for Professionals Too! Since just a little bit of high-speed flash goes a long way to accelerate your storage, we added an additional drive bay to the Drobo 5D and Drobo Mini. 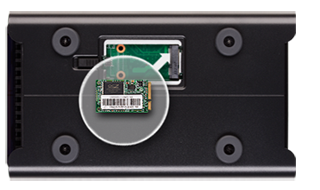 It’s called the Drobo Accelerator Bay and it accepts an industry-standard mSATA SSD. Since these very compact SSDs are being used in the new Ultrabook family of portable computers, they are becoming readily available and very affordable. So you can add flash to your Drobo without consuming one of the standard drive bays, which are best used to maximise capacity.